Young-adult biographer Doherty (Ronald Reagan, 2005, etc.) 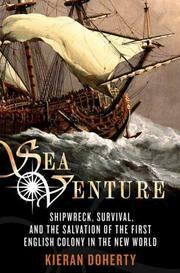 recounts a fascinating saga of shipwreck and survival. Readers intrigued by the last-minute-rescue subplot in Benjamin Woolley’s recently published Savage Kingdom (2007) will especially welcome this detailed treatment of the 1609 voyage intended to re-supply the struggling Jamestown colony. A violent storm forced the flagship Sea Venture aground in Bermuda, whose dangerous reefs and treacherous shoals had hitherto protected the islands from exploration by Europeans. Charmed by the climate, surprised by the abundance of fish and fowl, the survivors pieced together two ships and carried on to Virginia, arriving at the tail end of the Starving Time that had reduced the colony of 500 to 60. The provisions brought from Bermuda swiftly ran out, and the colonists were about to abandon Jamestown on the very day Lord De La Warre’s relief fleet arrived. Returning to Bermuda for more food, Sea Venture veteran Admiral George Somers died there, prompting his nephew to sail straight for England with tales of the marvelous new opportunity the islands offered. He left behind three Englishmen who discovered ambergris; the huge potential value of this rare substance engendered suspicion and avarice among them and conflict with the colonists who finally arrived in 1612. Doherty is especially deft at sorting out the roles of Sea Venture survivors in guaranteeing the success of the new colonies. Among those he spotlights: Virginia governor-designate Sir Thomas Gates, whose strong hand subdued mutinies in Bermuda; impoverished gentleman-poet William Strachey, whose account of the shipwreck and life on Bermuda provided Shakespeare with a template for The Tempest; and John Rolfe, husband-to-be of Pocahontas, whose experiments in tobacco cultivation ensured the colony’s survival. Doherty’s well-told yarn reveals the impulses both noble and base underlying any colonial enterprise, but it’s even more effective in showing the unsettling degree to which luck stirs human destinies.